The current political panorama will undoubtedly produce some outstanding critical fiction. Thankfully, we don’t have to wait long because some of it is already here. 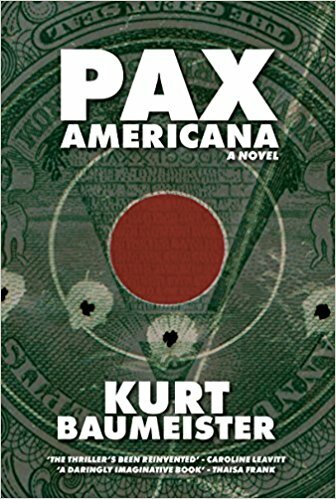 Kurt Baumeister’s Pax Americana, his first novel, is a strange hybrid narrative that weaves together a science fiction drama with a hilarious thriller and sprinkles the mixture with heavy doses of literary fiction, sociopolitical commentary, and satire. The result is an ambitious novel that somehow pulls it all off while demonstrating a level of creativity that can rarely be found in debuts. The year is 2034, and Dr. Diana Scorsi, a brilliant tech developer, has developed a program called Symmetra, with the capacity to synthesize all the world’s religious knowledge into a single spirituality. The benefits of this, especially in a world racked by religious divisions, are boundless, so she plans to give the program away for free. Unfortunately, before she can do it, Scorsi is kidnapped by Ravelton Parlay, an unscrupulous rich man moved by the money that lands in his pockets thanks to the reigning mix of Christian extremism and capitalistic opportunism, which is known as “Christian Consumerism.” Parlay has hired Internal Defense agent and Christian fanatic Tuck Squires to find Scorsi, and he succeeds, but when so much is at play, every situation is a power struggle, and hidden agendas constantly threaten every plan set in motion. If Symmetra was real, it would compete with God for man’s worship, and why would the Lord allow a thing like that to enter the world? Unless, of course, He hadn’t or had, rather, against His own will, as part of the End Times, as part of teaching man his final lesson, giving him over to Satan so that he might see where the path of evil would invariably lead. Which meant that if the Symmetra was real, and it did what the specs said, it might not actually be the work of man at all. It might be part and parcel of the powers of darkness. By 2034, Bobby Jindal had spent twenty-two years as Governor of Louisiana. In that time Jindal had presided over six Category 5 hurricanes—Biffy, Poffy, Tippy, Albertine, Screwy, and Lu-Lu—the repeal of gubernatorial term limits, and a Golden Age of Christian Capitalism. Headquarters to Righteous Cheeseburger along with numerous Christian oil companies and the burgeoning Christian high-protein gator-farming industry, Louisiana’s coffers filled in the Jindal years, not just because of reductions in social spending but long-sought tax breaks that incentivized wealthy individuals, religious entities, corporations, and admixtures they’re off to relocate to the Bayou State. While there is plenty of humor, action, and science fiction, what ultimately makes Pax Americana feel timely and necessary is that it reflects an augmented, somewhat cartoonish version of the current political panorama while simultaneously playing with the possibilities of a parallel political history that might have stemmed from the real/fictional George W. Bush administration. Furthermore, this intricate text of hidden agendas, evil wishes, violence, and religion does a superb job of exploring the flaws of religious devotion, uncontrolled consumerism, and patriotic ardor, especially the impossibly dark and scary part of the Venn diagram where all three meet. Pax Americana is an absurd book, but not too absurd. In fact, the preposterousness found in its pages reverberates with warnings about the possible outcomes of some of the tendencies we’re reading about in news websites every day. This is a book that imagines the future of America based on a different past, but which shows things that our future might push out of the realm of fiction into that of reality, and that makes every laugh produced by its pages a true triumph.